Constructing triangles, we need three measurements. Even we can construct a triangle when the base, one base angle and the sum of the other two sides are given or given its base, a base angle and the difference of the other two sides or given, its perimeter and two base angles. Here, I have explained you this type of construction. 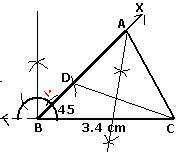 1) Construct a Triangle, when its base, sum of the other two sides and one base angle are given. Constructing triangle ABC in which AB = 5.8 cm , BC + CA = 8.4 cm and ∠B = 45°. Step 1: Draw a line segment AB 5.8 cm. Step 2 : Draw ∠B = 45°. Step 3 : With Center B and radius 8.4 cm, make an arc which intersects BX at D.
Step 4 : Join D to A. Step 5 : Draw a perpendicular bisector of segment DA it intersect the line segment BD at point C.
Step 6 : Join C to A. 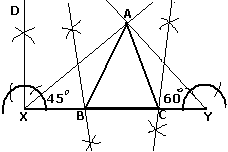 2) Triangle construction, when its base, difference of the other two sides and one base angle are given. 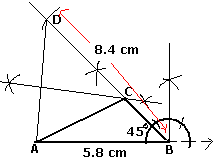 Construct a triangle ABC in which BC = 3.4 cm , AB - AC = 1.5 cm and ∠B = 45 0 . Step 7 : Join A to C, ABC is the required triangle. 3)Construction of a Triangle of given perimeter,and two base Angles. AB + BC + CA = 12 cm ∠B = 45 0 and ∠C= 60°. Step 6 : Triangle ABC is the required triangle.